Home » cash » Food n Beverage » gold » lucky » lucky draw » Nestle » offline contest » purchase » qna » spend » WhatsApp » Peraduan NESTLÉ Wow Wow Ang Pow Contest: Win Up to RM18,888 cash & Gold Coins! 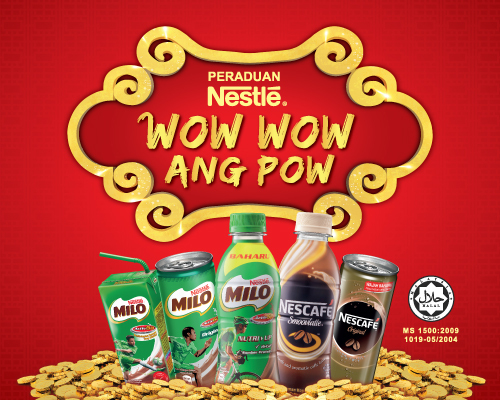 Peraduan NESTLÉ Wow Wow Ang Pow Contest: Win Up to RM18,888 cash & Gold Coins! Fifty Consolation Prizes of 1g 999 Gold Coin each. Buy a minimum of Ringgit Malaysia Four [RM4] of any participating NESTLÉ Ready To Drink products in a single receipt. Write down on the original single printed receipt the required details of your full name, identification number, correct answer to the one  question shown on the Promotion entry form and tick the Products and purchase amount. Complete each entry form with the required details and one  correct answer. The completed entry form together with the POP must be inserted in an envelope and posted by ordinary mail only to the PO Box address stated in the entry form. Snap one  picture of the POP complete with required details, outlet name, date of purchase, ticked Products and purchase amount. Submit the picture via whatsapp to 011-5660 0747. Visit Peraduan NESTLÉ Wow Wow Ang Pow contest terms & conditions for more details, or you may download the Contest Form here.